The unique process by which traditional Native American pottery is produced is as interesting as its designs and shapes. The clay and slip are dug in areas miles from home, usually only known to family members. Then the clay, after being cleaned of stones and sticks is rolled into coils. The pot is formed by wrapping the coils guided only by the artists hands into various shapes. The polished surface is achieved by first scraping and then burnishing the vessel for hours with a smooth stone. Finely ground minerals and plants that have been gathered by the artist in the desert are mixed with water to make the paints and with the use of a few fibers of the yucca plant provide the means to hand paint the pottery. Finally, the pot is fired in an open pit with sheep or cow dung giving it its distinctive coloration and shading sometimes known as fire or smoke clouds. 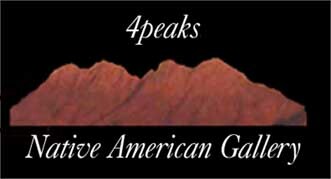 This traditional method is employed by most of the Native American artists thus distinguishing their works from the less expensive commercial pieces that use greenware and are fired in an electric or gas kiln. The beauty of this pottery is enhanced when one starts to appreciate the uniqueness of its creation.